Juice the lemons to make 1 cup of juice. To make your labor easier, FIRMLY roll the lemons between your hand and counter top before cutting in half and juicing. 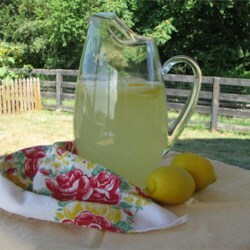 In a gallon pitcher combine 1 cup lemon juice, 1 cup sugar, and 6 cups cold water. Stir. Adjust water to taste. Chill and serve over ice. Previous Previous post: Sangria! Sangria!